Sticker Pixel Art: Animals: With Over 8,000 Colorful Stickers to Create 20 Amazing Pixel Paintings! Sticker pixel art is one of the latest trends in art activities. By arranging multi-colored square stickers on a grid, you can form beautiful pixelated images right before your eyes! 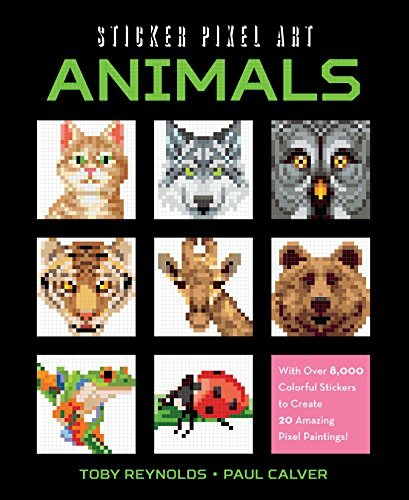 Included within this book are instructions on how to create pixel images of your favorite animals as well as the appropriate stickers needed to create them. It teaches you how to create pixel art cats, dogs, lions, bears, pandas, owls, koalas, snakes, and more! Also included are additional stickers and grids so that you can create your very own designs from scratch! It’s a fun activity for anyone to do by themselves or with the whole family!